Lancine Toure’s headed strikes helped Minerva to a two-goal lead before Leonce Dodoz pulled one back for Aizawl. Defending champions Minerva Punjab FC registered their first win of the I-League campaign, overcoming Aizawl FC 2-1 on the artificial turf of the Rajiv Gandhi stadium in Aizawl on Saturday. 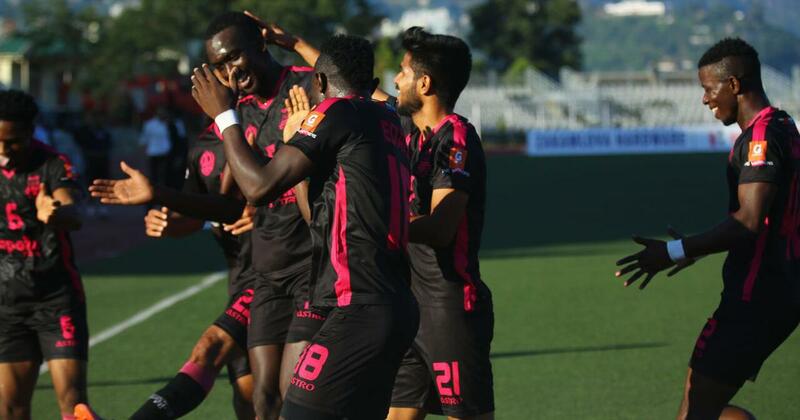 Two headers off two corners by centre-back Lancine Toure ensured that despite a late penalty conversion by Leonce Dodoz for the home side, the ‘Warriors’ from Punjab logged a full three points from a spirited encounter. The champions were clearly bolstered by the induction of two Nigerians, Donatus Edafe and Bala Alihassan Dahir, the former in particular having a huge impact on Minerva’s performance compared to their last two games. Hosts’ coach Gift Raikhan started Ivorian Dodoz and David Lalrinmuana on the day in place of Albert and Lalrinfela while Minerva brought in Bala Dahir and Edafe, replacing them with Akash Sangwan and Makan Chothe as well as Moinuddin in place of Ivorian Alexandre who had begun the last game. Dodoz cut in beautifully inside the box from the left and his effort brought about a save from Bhaskar Roy in the Minerva goal, who padded it away for a corner. In the sixth minute, Toure fouled David in a dangerous position outside the Minerva box. His free-kick on target was well collected by Bhaskar. Minerva then got a break when Toure’s header off a William Opoku corner gave Minerva their first goal of this I-League season and the lead. The goal shifted the momentum towards Minerva, and they put up a splendid display of fast counter attacks and innovative set pieces. Edafe’s ball skills and enterprise, in particular, will be a good omen for Irishman Paul Munster’s side going forward. In the 12th minute, Moinuddin was found free inside the box by Opoku, who in spite of having time and space to control, chose to go for a first timer but the ball lobbed over the Aizawl bar. Moinuddin then got one into the net of a cleverly-taken corner, but was called for offside. Aizawl too had their chances and In the 24th minute, Dodoz found Bektur inside the box with a wonderful pass and the Kyrgystani turned his defender and was ready to pull the trigger, but Arshdeep’s slide, left Bektur denied. That brought about a bit of rough play and resulted in a couple of bookings on either side. Novin Gurung was booked for a rash tackle on Moinuddin, who had to be eventually replaced by Akash Sangwan and Philip Njoku also picked up a yellow card for Minerva. Both sides missed a couple of more chances, but Minerva took their one goal lead into the lemon break. Aizawl again began the half stronger with Kromah striking a volley from just outside the box which went over. However, just like in the first half, Minerva came back into the game and Lancine Toure got his second headed strike in the 59th minute, again off a William Opoku corner which pierced Gurpreet in the Aizawl goal and the last defender on the line, going in on the bounce. The rest of the half was about Toure missing a couple of more headers from corners for his hattrick and Kromah for Aizawl muffing up another couple of chances. As the game seemed to be meandering towards a Minerva victory, the home team got a penalty to pull one back. A long ranger from distance found the outstretched hand of Akashdeep Singh inside the box and referee Raktim Saha had no hesitation in pointing to the spot. Dodoz converted despite Bhaskar Roy guessing the right away. Aizawl did try to press for the equalizer but Minerva, who had in between bolstered their defence by bringing in Deepak Devrani for Dahir, held out for a deserving first win. Cameroonian striker Dipanda Dicka, the top scorer of the last two editions of I-League, opened his account with a brace against the Indian Arrows, as Mohun Bagan registered their first win of this year’s edition at Cuttack’s Barabati stadium on Saturday. Dicka’s two first-half strikes, the second off a penalty, pulled Bagan up to the third spot in the league standings with five points from three games. The Arrows suffered their second loss and remain on three points. Floyd Pinto, the Arrows coach began with an unchanged eleven while Sankarlal Chakraborty of Mohun Bagan brought in Shilton Paul in goal in place of Sankar Roy. The Arrows strategy was clearly to sit back and defend as Bagan not only dominated possession but all the goal scoring chances of the first half as well. As early as the second minute, from an Arijit Bagui floater, Ugandan striker Henry Kisseka found himself in the clear inside the Arrows box but hit wide with only the keeper to beat. Then Dicka, in the seventh minute, got a free header from an Omar Elhusseiney cross from the left but headed straight to Prabhsukan Gill in the Arrows goal. Kisseka missed a couple of chances but the goal was coming for Bagan and it arrived in the 30th minute. Kisseka got hold of the ball outside the Arrows box on the right and bulldozed through three defenders to cross across and past Gill for Dicka, to score with a diving header. Just before the end of the half, Pintu Mahata, who had switched flanks, cut in from the left and his cross, caught the outstretched hand of a defender and referee Gupta pointed to the penalty spot. Dicka slotted in for his and Bagan’s second of the game to give them the required cushion going into the break. Floyd Pinto brought in Khumanthem Meetei in the second half in midfield in place of right back Aimol in a clear change of tactics intended to bring in more attacking impetus. Among the best chances for Bagan in the second half was in the 68th minute when from another Arijit Bagui cross from the right flank, Dicka rose to connect with a perfect header but the goal-bound ball was brilliantly tipped over the bar by Gill. 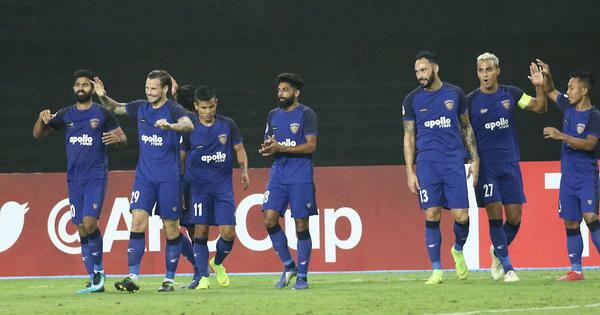 As the game neared its end, Pinto brought in Abhijit Sarkar to bolster the strike force and the Arrows did create some flutter in the Bagan defence to finish strong, but the Kolkata side were through. Bagan’s Haitian star Sony Norde, on his comeback post a long injury lay-off was again brought into the game, this time in the 65th minute. Arrows were unable to muster any attacks as Bagan held on for the victory.